(Nanowerk News) One of the greatest challenges in the evolution of electronics has been to reduce power consumption during transistor switching operation. In a study recently reported in Nature ("A subthermionic tunnel field-effect transistor with an atomically thin channel"), engineers at University of California, Santa Barbara, in collaboration with Rice University, have demonstrated a new transistor that switches at only 0.1 volts and reduces power dissipation by over 90% compared to state-of-the-art silicon transistors (MOSFETs). MOSFETs have been the building blocks of everyday electronic products since the 1970s. However, to sustain the ever-growing need for increased transistor densities, miniaturization of MOSFETs has given rise to a power dissipation challenge due to the fundamental limitations of their turn-on characteristics. "The steepness of a transistor's turn-on is characterized by a parameter known as the subthreshold swing, which cannot be lowered below a certain level in MOSFETs," explained Kaustav Banerjee, Professor of Electrical and Computer Engineering at UC Santa Barbara. A minimum gate voltage change of 60 millivolts at room temperature is required to change the current by a factor of ten in MOSFETs. In essence, the existing state of transistor technology limits the energy efficiency potential of digital circuits in general. 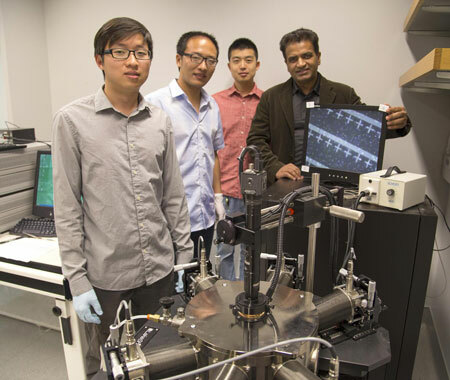 Professor Kaustav Banerjee (right) with researchers in his Nanoelectronics Research Lab at UC Santa Barbara. The research group of Professor Kaustav Banerjee at UC Santa Barbara took a new approach to subverting this fundamental limitation. They employed the quantum mechanical phenomenon of band-to-band tunneling to design a tunnel field effect transistor (TFET) with sub-60mV per decade of subthreshold swing. "We restructured the transistor's source to channel junction to filter out high energy electrons that can diffuse over the source/channel barrier even in the off state, thereby making the off state current negligibly small," explained Banerjee. At UCSB, Banerjee's Nanoelectronics Research Lab includes Deblina Sarkar, Xuejun Xie, Wei Liu, Wei Cao, Jiahao Kang, and Stephan Kraemer, as well as Yongji Gong and Pulickel Ajayan of Rice University. Banerjee and his colleagues are motivated by a global electronics industry that loses billions of dollars each year to the impact of power dissipation on chip cost and reliability. "This translates into lower battery lifetime in personal devices like cell phones and laptops, and massive power consumption of servers in large data centers," adds Banerjee, pointing out the global scale of this energy demand. An industry that relies on conventional semiconductors such as silicon or III-V compound semiconductors as the channel material for TFETs, Banerjee explains, "faces limitations because these materials have high density of surface states, which increase leakage current and degrade the subthreshold swing." The TFET designed by the UCSB team overcame this challenge in a few ways, most significant being the use of a layered two-dimensional (2D) material called molybdenum disulphide (MoS¬2). As the current-carrying channel placed over a highly doped germanium (Ge) as the source electrode, MoS2 offers an ideal surface and thickness of only 1.3nm. The resulting vertical heterostructure provides a unique source-channel junction that is strain-free, has a low barrier for current-carrying electrons to tunnel through from Ge to MoS2 through an ultra-thin (~0.34nm) van der Waals gap, and a large tunneling area. "The crux of our idea is to combine 3D and 2D materials in a unique heterostructure, to achieve the best of both worlds. The matured doping technology of 3D structures is married to the ultra-thin nature and pristine interfaces of 2D layers to obtain an efficient quantum-mechanical tunneling barrier, which can be easily tuned by the gate," commented Deblina Sarkar, lead author of the paper and PhD student in Banerjee's lab. "We have engineered what is, at present, the thinnest-channel subthermionic transistor ever made," said Banerjee. Their atomically-thin and layered semiconducting channel tunnel FET (or ATLAS-TFET) is the only planar architecture TFET to achieve subthermionic subthreshold swing (~30 millivolts/decade at room temperature) over four decades of drain current, and the only one in any architecture to achieve so at an ultra-low drain-source voltage of 0.1V. Ajayan, co-author and professor of chemical and biomolecular engineering at Rice University, commented, "This is a remarkable example showing the uniqueness of 2D atomic layered materials that enables device performance which conventional materials will not be able to achieve. This is perhaps the first breakthrough in a series of novel devices that people will now aspire to build using 2D materials." "The work is a significant step forward in the search for a low voltage logic transistor. The demonstration of sub-thermal operation over four orders of magnitude is impressive, and the on-current also advances the state-of-the-art. There is still a long ways to go, but this work demonstrates the potential of 2D materials to realize the long-sought, low-voltage device," commented Mark Lundstrom, professor of electrical and computer engineering at Purdue University. "We have demonstrated how to achieve the most important metric of steep subthreshold swing that meets ITRS requirements. Our transistor can be utilized for a number of low-power applications including arenas where the steep subthreshold swing is the main requirement, such as biosensors or gas sensors. With improved performance, the range of applications of this transistor can be further expanded," explained Wei Cao, a PhD student in Banerjee's group and a co-author of the article. "This work represents an important step of bringing 2D materials closer to real applications in electronics. The use of 2D materials in tunneling transistors started only recently, and this paper gives the whole field yet another strong boost in improving the characteristics of such devices even further," commented Dr. Konstantin Novoselov, a professor of physics at University of Manchester. Novoselov was co-recipient of the 2010 Nobel Prize in Physics, awarded for the discovery of graphene. "When I first heard Banerjee's idea of using 2D materials for designing inter-band tunneling transistors in 2012, I recognized its merit and immense potential for ultra-low power electronics. I am pleased to see that his vision has been realized," commented James Hwang, professor of electrical engineering at Lehigh University, who was then the AFOSR program manager responsible for funding this research.